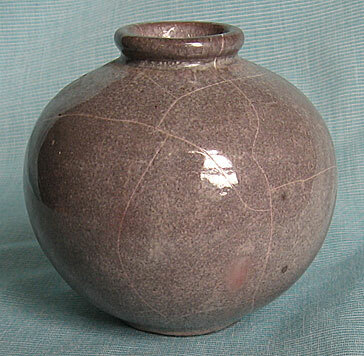 This small German vase has only a faint mark, but design, bottom, and clay all indicate that it's a Paul Dresler design from Grootenburg studio shortly before or after WWII. Most of Dresler's work has a matte glaze, and the best known is the red/green copper patina color. 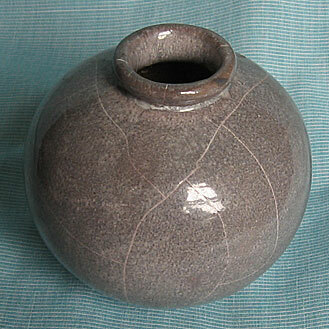 So this vase is uncommon with a somewhat glossy glaze and the gray tones. The vase is handmade and hand decorated, as usual with the Grootenburg work. 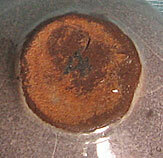 The lines in the glaze are melt fissures, which are sometimes a failed glaze, but Dresler and some others created them as an aesthetic addition to the work, bringing to mind in some ways the Japanese kintsugi approach, repairing items with gold to highlight the repairs, celebrating them rather than hiding them.